Even mermaids enjoy a glass of wine from time to time. 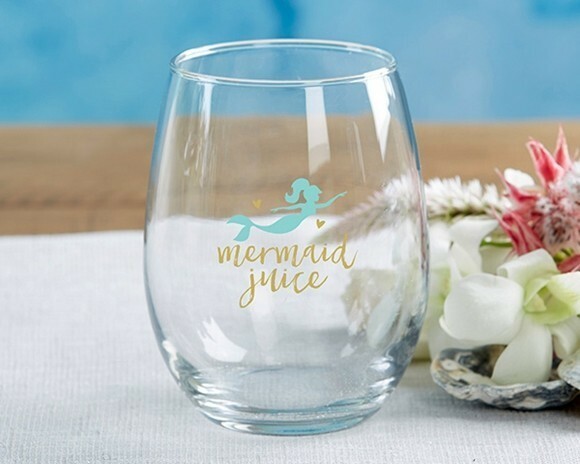 Adorned with a turquoise mermaid and the tag-line "Mermaid Juice," printed in gold ink and accented with gold stars, these "Seaside Escape" collection stemless wine glasses are perfect favors for your beach-themed bridal shower, birthday or any other seaside soiree. PLEASE NOTE: Sold in a set of 4 and prices quoted below are per set. Please also note that while we package all personalized glassware with extra care, we cannot replace any glassware that may break while being shipped by UPS or FedEx. It's always a good idea to order extra quantity (5% is the rule of thumb) to account for shipping damage or unexpected guests.